If you try to follow every recommendation from every non-toxic writer on the Internet, you can quickly become overwhelmed. There is even too much information on my website, and I fully understand that. 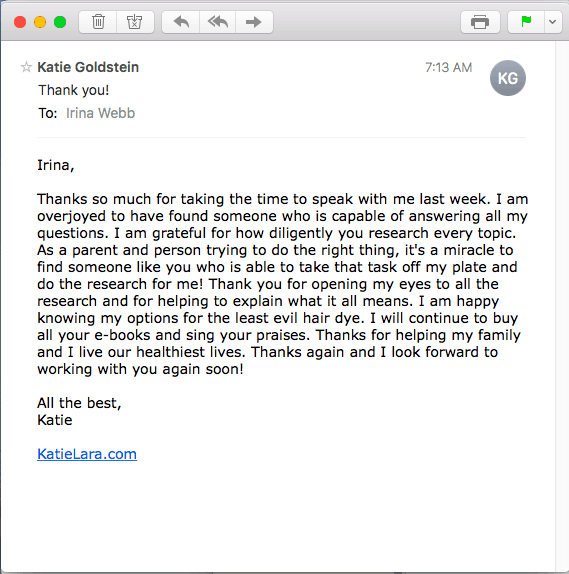 Wouldn’t it be nice to talk to somebody who can distill it all for you, and present you with a clear and actionable plan that works for YOU? 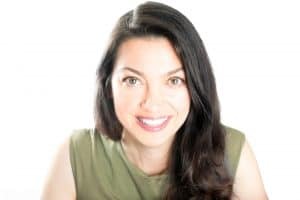 What if you knew you were making the most important changes first with no mind-numbing hours of research or paralyzing indecision on which products to buy and use? When you have clarity and the products you need, you can begin advancing on the path of your optimum health. 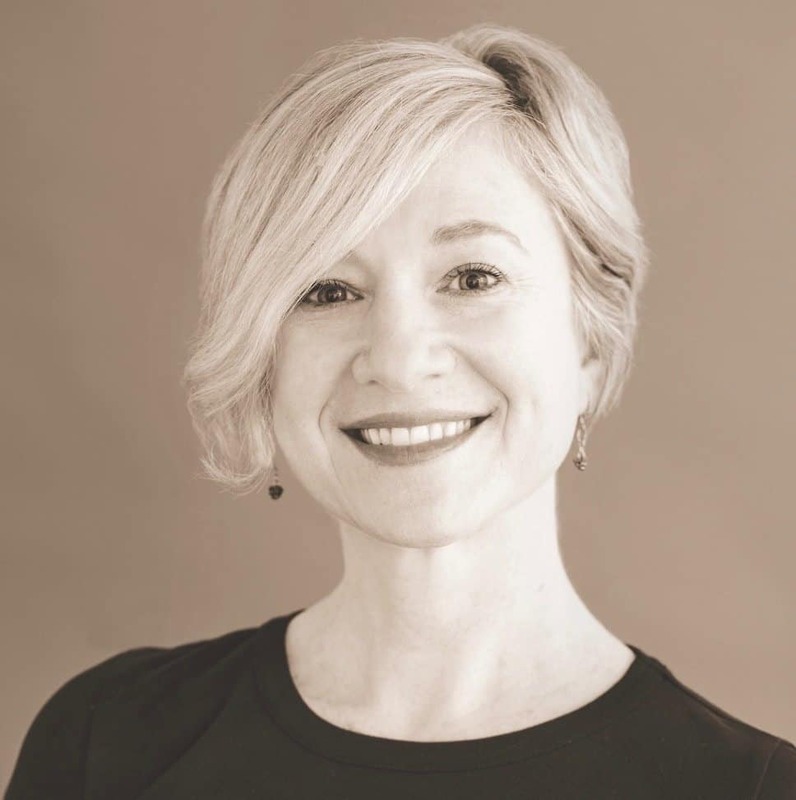 ​As a result of years of non-toxic living, and with the help of a functional medicine doctor, I was able to recover from Hashimoto’s Thyroiditis, an autoimmune condition, and I have made a lot of progress in reversing Addison’s, another chronic autoimmune illness. 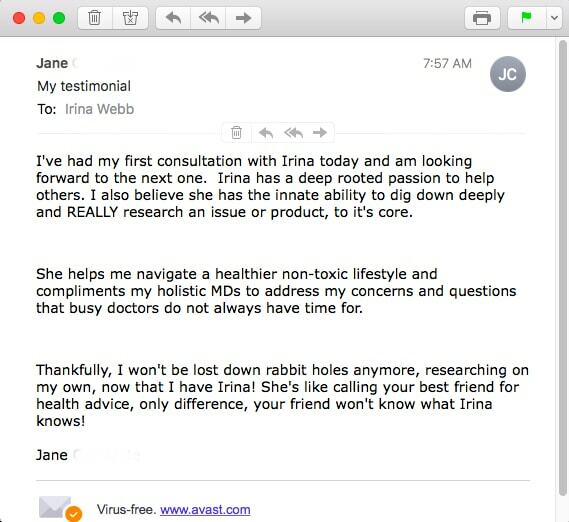 I partner with medical professionals to support their patients in ridding their home of harmful chemicals. And I can help you, too. ​The truth is that building a sustainable healthy home isn’t complicated – but there are a hundred little details to manage at once, and that’s what makes it difficult and confusing. Here are some of the questions my clients ask – do any of these sound familiar? >>> The more I dig, the more I learn and the more I uncover... it is exhausting. What is your recommendation for a mattress? >>> I am not ready to show my grey hair to the world. And I know hair dyes are toxic. What do I do? >>> I have recently had some health issues that have led me in the direction of finding safer products. I now want to rebrand my salon and myself and also help people become more aware of what they are using. >>> My holistic doctors want me to live a non-toxic lifestyle. Where do I start? >>> I am in a process of doing my wedding registry. Can you help? >>> We just bought an old house that will need some remodeling and renovating. How do we make sure that we end up with a home that is safe? Most people struggle because they get lost in the details, or they do not know what the alternatives are, or don’t know where to start. ​The good news is, you don’t have to know everything to live a non-toxic healthy lifestyle. When you work with me, you just need to be open to new ideas and to follow through on the action steps we create together. You will have fun, too! Getting an expert input can save you hundreds of wasted hours and money on products you do not like. Before a consultation with Irina, I felt confused and concerned about mattress options for my son. I was overwhelmed about how to limit toxin exposure in general. After I spoke with Irina, I felt confident that it was best to purchase a new mattress for my son. She helped greatly with determining which mattress to get. 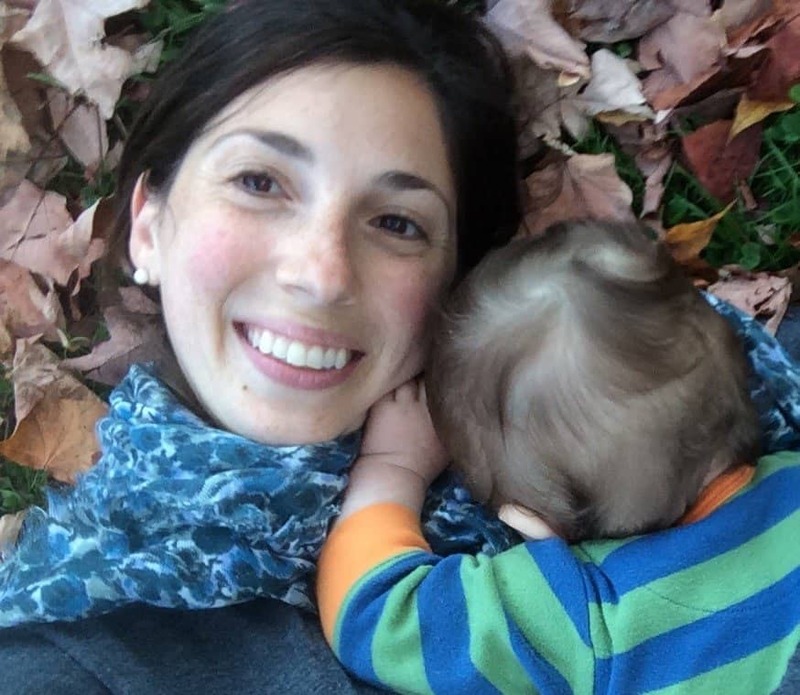 I became more informed and felt empowered about how to choose healthy products for my family. 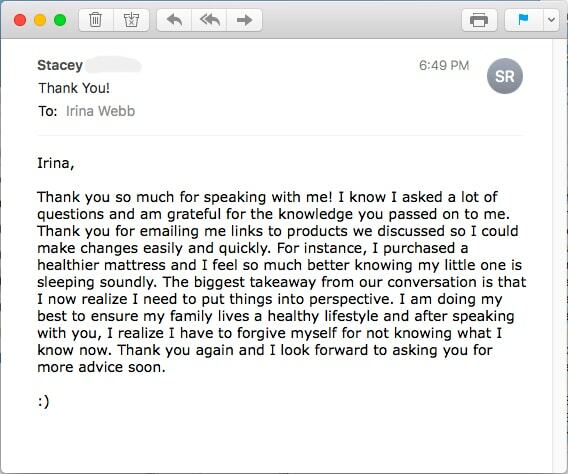 I greatly appreciate Irina’s dedication and wisdom. As a hairstylist and owner of Suzanne's Organics Salon I am always looking for more information on how to avoid potentially toxic chemicals. I seek to educate myself on the latest research and look for new companies that are wholeheartedly committed to transparency. I appreciate any help I can get because this is a difficult task. I came across Irina's Permanent Hair Color Rating List and decided to set up a consultation with Irina. I was looking for a someone outside of the industry, not trying to sell me a color line, that could give me honest insight from the research. 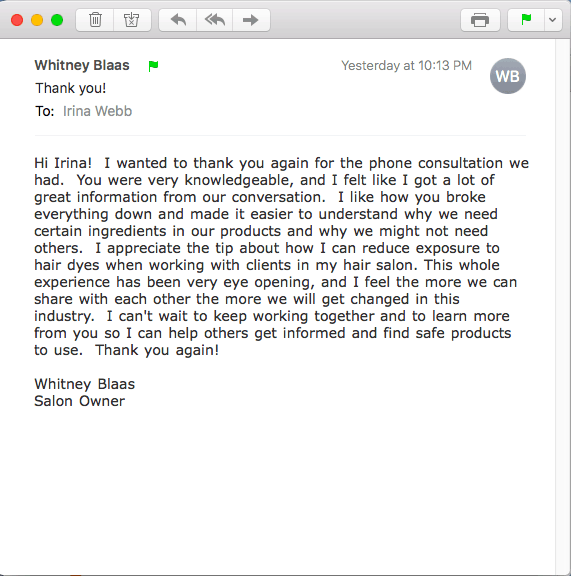 I found Irina to be extremely detailed and earnest in her approach to analyzing the ingredients in both traditional hair color as well as companies that claim to be organic. 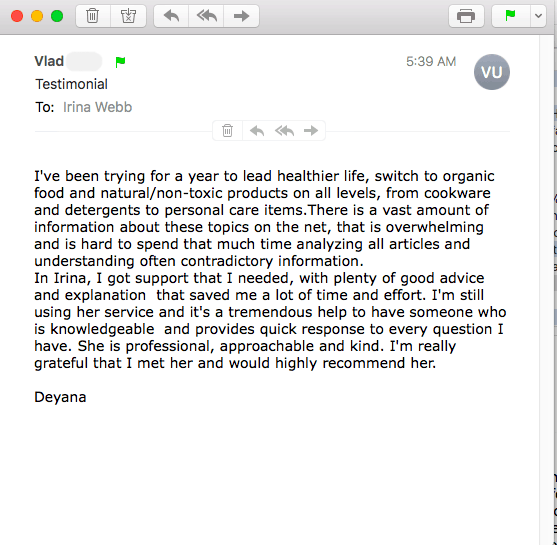 The information I received from Irina will help me continue to make the best decisions possible for my company as well as better serve and educate the staff, clientele and community. 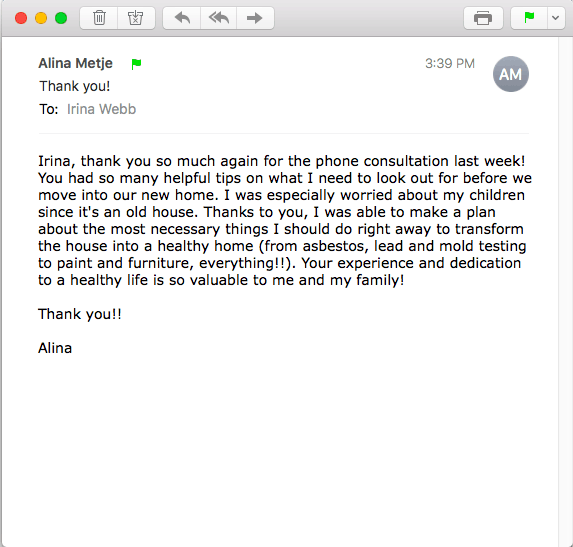 Thank you Irina I look forward to our next conversation! ​A one-to-one Healthy Living Intensive session with me is $97. Email me with your 2-3 availability options. Please indicate your time zone. I am on PST. My Gold Coaching Program is tailored to your specific health, your doctor’s recommendations, and your starting point. I will take into account your lifestyle, your preferences, and your capacity to make changes that will become your habits. I will evaluate your home routine to see where you might be exposed to harmful chemicals. >>>Not only will we identify the things that are standing in the way of your healthy living, we’ll also review potential solutions and you’ll leave with specific steps that will move you closer to your goals. >>>We’ll start with setting realistic goals for creating a healthy non-toxic home and identify the areas where you most need to make changes; these changes will have the biggest impact. >>>Then we’ll work together to make sure that you implement the changes. >>>Whatever your priorities are, we’ll focus on taking practical steps to make your goals a reality. You’ll leave every coaching session with a solid understanding and a clear plan for the next steps…and of course, the follow-up and accountability to make sure you cross the finish line. ​The Gold Coaching Program is a package of 4 sessions for $295. Bonus #1: You will have lifetime access to writen materials, worksheets, and cheatsheets. Bonus #2: Ask me about a wonderful bonus available while supplies last. Bonus #3: Fun and joy!